The ongoing crisis of our health system is nothing new, but things are now taking one strong turn for the worse. This great report by the AP’s regional correspondent Frank Bajak resumes the terrible situation faced by both public hospitals and private clinics, and the living hell that many patients get through to obtain treatment. It’s a little bit lenghty, but worth a read. 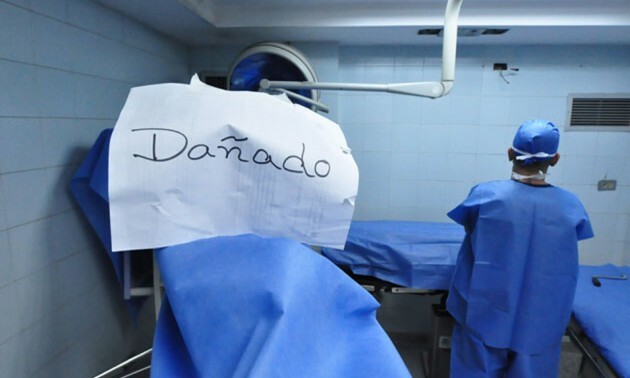 “Doctors not allied with the government say many patients began dying from easily treatable illnesses when Venezuela’s downward economic slide accelerated after Chavez’s death from cancer in March. Doctors say it’s impossible to know how many have died, and the government doesn’t keep such numbers, just as it hasn’t published health statistics since 2010. Almost everything needed to mend and heal is in critically short supply: needles, syringes and paraffin used in biopsies to diagnose cancer; drugs to treat it; operating room equipment; X-ray film and imaging paper; blood and the reagents needed so it can be used for transfusions. And in what can be considered as a case of good timing, it comes just as Health Minister Isabel Itúrria was unceremoniously dumped from the job yesterday, after only a little more than six months in charge. It was enough time, though to bungle the recent H1N1 outbreak and witness the biggest spike of malaria cases on record. Her predecessor Maria Eugenia Sader was no better, though. To be honest, looks like the government ran out of options as they just brought back Francisco Armada Pérez, who was Health Minister between 2004 and 2007 and the only guy to repeat in the post since 1999.